When it comes to spirits, the “angel’s share” is the portion that evaporates over time, escapes the barrel, and ascends to the heavens. The new Angel’s Envy bourbon sets out to create a finished bourbon that makes those angels envious. The Angel’s Envy project may be new, but Lincoln Henderson, the man behind it, certainly isn’t a bourbon novice. Before founding the Louisville Distilling Company, Henderson was in charge of operations at the Woodford Reserve and Old Forrester. His first solo offering is Angel’s Envy 10/10, an aged, small-batch bourbon that’s finished in port casks. Named for the October 2010 release date, Henderson is planning future versions that will use different barrels for finishing. Currently, Angel’s Envy is available in just a few states. But I was able to secure a sample of the unique bottle ($45 at retail). The sample I tasted has a light bronze color and was bottled at 86.8 proof. The nose boasts a port barrel finish along with sweet toffee. As for taste, I find cream, nut, apricot, pine, and oak. The bourbon coats the palate and leaves your lips with a tingle of red pepper spice. The long finish starts out with honey and ends with a reminder of the port barrels. All in all, based on the sample I tasted, this is an interesting and welcome addition to the already numerous fine bourbons being produced. 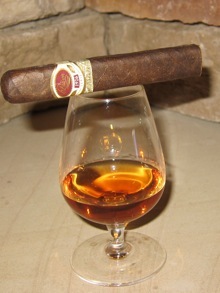 It deserves to be tasted neat and pairs well with a good cigar. As for that cigar, I found the spice of a Honduran or Nicaraguan smoke to be an excellent accompaniment, as the Angel’s Envy certainly has the structure to stand up to a full-bodied smoke. Recommended smokes include the Room 101 Conjura, Tatuaje Unicos, and San Lotano Habano. For those more Cuban-inclined, I’d go with the Ramón Allones Specially Selected or Bolivar Royal Corona. Thanks for the wonderful review. Can't wait to try the recommended smokes! My current go to is Blanton's, but this sounds interesting and a few bucks cheaper. I'll definitely want to pick up a bottle.